With the Mooer MEP-L6 Pedal Loop Controller, controlling your pedals has never been so easy and convenient. 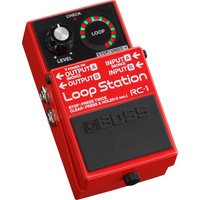 The L6 is a programmable 6 channel loop controller. After connecting your pedals to the 6 true bypass loops, the L6 provides a control hub right at the front of your pedalboard which can be operated in two different ways. In preset mode, any combination of multiple loops can be instantaneously engaged or disengaged at the touch of a single footswitch, without the need to tap dance all over your pedalboard. In this mode the Loop Controller has 6 banks, with 6 presets in each bank, giving a total of 36 possible preset pedal combinations available. In Live mode the L6 operates in a more traditional manor. 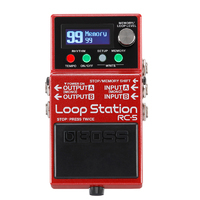 Each loop has its own dedicated footswitch which simply engages and disengages its respective loop. This is perfect for the more old school musicians who simply want their pedals' footswitches conveniently relocated for easy access. Each loop has a backlit display panel which can be written on, or you can use the coloured stickers provided. This makes it easy to see at a glance which loops are engaged and disengaged. The L6 has a precise built in tuner based on Mooer's very popular Baby Tuner and a tuner output, should you prefer to use your favourite dedicated tuner pedal. Complete with two different buffers (pre and post), you don't need to worry about tone loss due to long cables.